Return true if there are tagged particles in the hint. Add a range of particles to the list of tagged particles. Add a particle to the list of tagged particles. Return a pointer to the default hint. Assignment is private and non-existing. The vector of tagged particles. Hint is a base class to be used to pass information between StepHandler s, which cannot be convayed through the Event record. The base class contains a vector of of tagged particles. A StepHandler is always given a hint, and is only allowed to treat Particles from the current Step which are listed in the vector of tagged particles in the hint (if this vector is empty the StepHandler may treat all particles in the Step. A Hint may have the stop flag set. In this case the StepHandler to which the hint is assigned is not called, and the event generation is stopped. A Hint may be given a scale, but what a StepHandler does with this and other pieces of information possibly supplied by subclasses of Hint, is not defined. There is a special Hint which is kept as the static member called Hint::theDefaultHint. 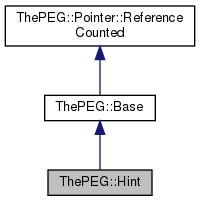 Although any default constructed Hint object would work as a default hint, only pointers to this static object should be used where a default hint is needed. Definition at line 48 of file Hint.h. Return a list of pointers to particles to be handled. A handler is not allowed to touch other particles in the event record. If a particle which has been flagged by the hint is no longer present in the current Step, a null pointer is inserted in its place.